Clean mussels and marinate it with 1- 1 1/2 tsp pepper powder, 1 tsp turmeric powder and salt and keep it aside for 30 minutes. Heat oil in a pan and fry well the marinated mussels and keep it aside. In the same oil, add curry leaves and ginger- garlic paste and saute well. Add chopped onions and green chillies and saute well for few minutes. Add 1/2 tsp pepper powder, 1/2 tsp turmeric powder and enough salt and mix well. Then add fried mussels and stir well for 2-3 minutes. Looks so tempting and yummy. 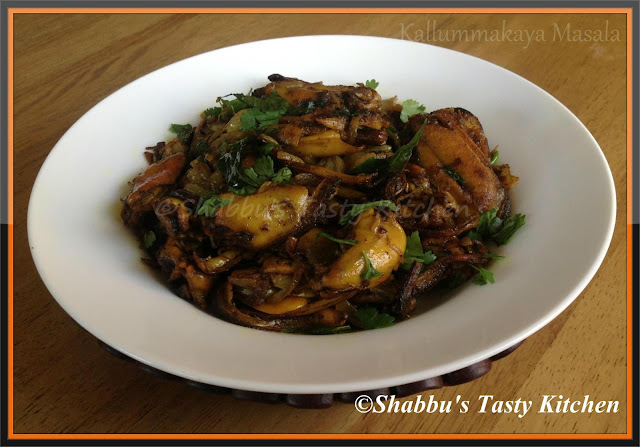 good clicks n nice recipe..
Tell me this.I am drooling here..Nice spicy kallummakkaya. Never tasted mussels before, but this masala looks droolworthy.